For many people, when they think of the Algarve in Portugal, they conjure up images of turquoise waters, wide sandy beaches and cliff-fringed coves. Beach life certainly is a major draw for the area, but there is plenty more to do here besides. Golf, gastronomy and good old-fashioned gift shopping are just several of the pastimes that you can indulge in during your stay in Alvor and this one-day itinerary shows you how to get the best out of all three, especially if you are in the area for a limited time. The Algarve has grown an international reputation for its volume and variety of golf courses. These days it is a favourite destination all year round for visitors from every corner of the globe, keen to practice their swing and test their handicap on the long fairways and tightly clipped greens in a spirit of relaxation under the Portuguese sun. Alvor is located on the western flank of Portugal’s Algarve and has some eight golf courses all within easy reach of the town’s hotels and apartment complexes. The Alto course is set within the grounds of the Pestana resort and is one of the most enjoyable places to play golf on the Algarve. We recommend an early tee time in order to maximise your time and to avoid the hottest sun in the early afternoon hours, especially if you are visiting during peak season. 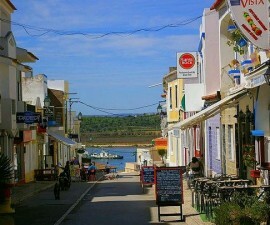 Alto is well located close to Alvor at the edge of neighbouring Portimão. This is the largest town in the area and where you will be spending the majority of your day. The Alto course is set in a raised area and comprises a weaving circuit that twists and turns its way through shrubs and greenery, which open out every now and then to produce a flourish of gleaming turquoise from the waters of the Atlantic beyond. Inaugurated in 1991, Alto was designed by the legendary Sir Henry Cotton and is a challenging yet delightfully enjoyable course suited to all levels of player, subject to a maximum handicap of 28 for gentlemen and 36 for ladies. Tee times can be booked directly with the course or via your concierge or hotel reception – do check with your accommodation before booking as many establishments in the area have discount agreements in place with the major courses on behalf of their guests. Note also that golf wear and appropriate golf shoes are expected on all the Algarve courses – whilst this does not mean that you need to kit yourself up in the latest golf fashions, it is worth remembering not to turn up in casual clothes and a pair of trainers. Once your round is over, you will need some sustenance to recoup your energy levels and give you the impetus to get started on the second part of your day. Grilled sardines make a wonderful light lunch, either on the beach or in one of the harbour-front restaurants at the front of town and are typical of the region. Portugal is a shopper’s paradise and the area around Portimão is the perfect place to stock up on artisan goods as gifts and mementos of your trip, as well as some high street bargains. Check out the streets around central Portimão for quirky stalls and boutiques selling hand-painted ceramics, embroidery and linen, hand-made jewellery and of course some delicious bottles of the famous Port wine. Once you have had your fill, head to one of the many retail outlets such as the Continente Shopping Centre on the outskirts of town to hunt out some larger-scale bargains. The Continente Shopping Centre is home to several floors of shops and is a great place to pick up some cut-price golfing gear and other bargains. Once you have shopped until you drop, it is time to return to your hotel, soak in a relaxing tub and get ready for an evening of gastronomy. Our trip takes you to Buzio Restaurant in the nearby Prainha development for a leisurely dinner in this traditional chalet-style property, perched above the water and offering extensive views out across the bay to Lagos and over the Atlantic to the horizon beyond. Featuring in the pages of the “bible” of travel and gastronomy, the Michelin Guide, Buzio Restaurant has been established in the Alvo/Portimão area for many years and continues to please its new visitors and loyal clientele who return there year after year. The menu serves classic Portuguese dishes with modern flair and, like most restaurants in Portuguese coastal areas, well-cooked fish and seafood features strongly. Try the red sea bream with coriander olive oil and mashed potatoes or the marinated grouper with mustard sauce for a taste sensation, washed down with a pleasant glass of the local white. Try to arrive before dusk and book in advance to secure yourself a table on the terrace or at one of the panoramic glass windows to admire the tangerine-pink sunset in all its glory. 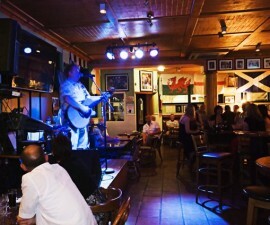 Expect to spend €50.00 – €100.00 on a meal for two – and rest assured it will be worth it.